I was attending a writers retreat. I hadn’t known anyone when I first walked through the doors. The one thing about writers is most of us are introverts, so when we gather, at least we’re all awkward together. This particular morning was “breakfast on your own.” We had been encouraged to make plans with other attendees and network over breakfast. I had no plans. I’m terrible at networking. I like to hang around people I already know in big groups. My new friend and roommate was having breakfast with other cowboy fiction writers. I love fiction and cowboys, but I don’t write it. My other new friend and roommate had plans for a one-on-one meeting. So I traveled down the elevator alone, my stomach sinking with each floor, feeling much like a 12-year-old looking for someone to sit with in the middle school cafeteria. I would have skipped breakfast, but I was starving. I was on the West Coast, my body was on East Coast time and complaining that it was nearly lunch time. Then I remembered. I’m not alone. I don’t walk anywhere alone. How often I forget! Lord, I’m yours. Use me as you wish today. If I can encourage or help someone, put them in my path. Who do YOU want me to have breakfast with? My spirit settled, and rather than focusing on myself and wondering (again) if I fit in, if anyone likes me, if there’s a place for me to belong, I remembered I belong to Him. He likes me, even loves me! And He has a place for me, even at breakfast. I asked if I could join a nearly empty table. The ladies smiled and welcomed me. The table slowly filled and we had a delightful conversation about southern fried food. Nothing earth shattering or overly spiritual, but pleasant. “Thanks for the nice ladies,” my heart whispered to God. The conversation quickly jumped from writing to parenting, and as she shared her story, I felt like I was looking in the mirror. She talked about fear and anxiety and worry. God nudged me to share my story of anxiety and panic as a young mother. Her eyes lit up as she confessed how alone this journey can feel. By the end of the conversation we were both brushing away tears and hugging like old friends. God is so gracious to meet us where we are and help us know we are definitely not alone. I told her about my elevator prayer. 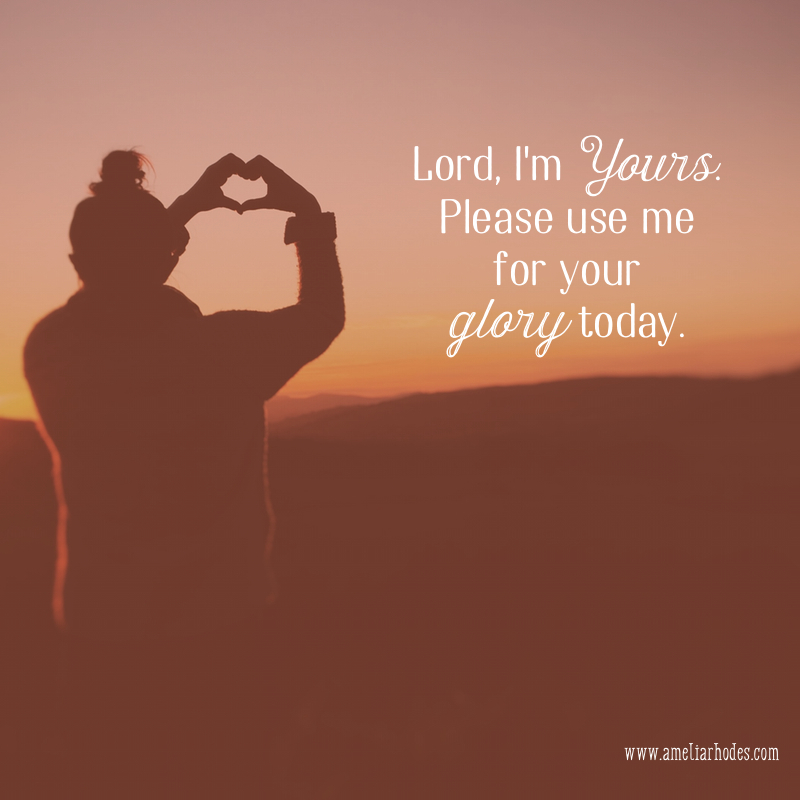 This simple prayer changes my days: Lord I am Yours. Please use me for your glory today. Sometimes it’s divine meetings like that breakfast. Sometimes it’s just the way He shifts my focus away from myself and opens my eyes to those around me. Whether you’re feeling left out, nervous about the upcoming interview, feeling out of your comfort zone, or even like your life is wandering without purpose right now, ask God to use you, wherever you find yourself. 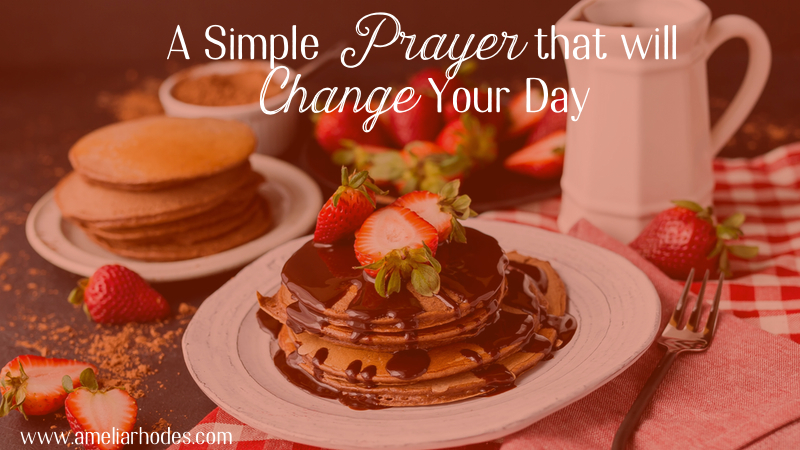 How have you seen God change your days as you pray and ask Him to use you? Free to Lean: Making Peace With Your Lopsided Life by Jocelyn Green – this book had so many encouraging stories, and I especially appreciated the chapter where she discussed “Seize God” (rather than “Seize the Day!”). Great encouragement for holding onto God first and every day. Dream Big, Think Small: Living and Extraordinary Life One Day at a Time by Jeff Manion – Broken into daily readings, this book really helped me realize the value of the small things we do every day (often over and over) and how they build a great life of faithfulness as we follow God in our everyday lives. Also, you can watch the sermon series here. 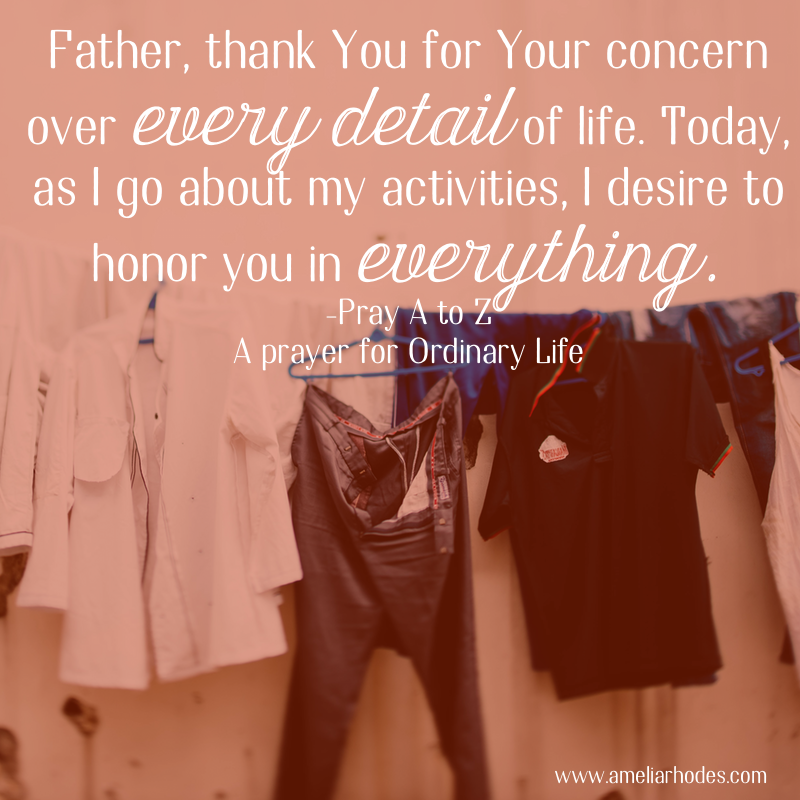 Pray A to Z: A Practical Guide to Pray for Your Community includes a prayer on the topic of “Ordinary Life,” with encouragement to bring to God every detail of your life, not just the big challenges, but also the daily routines. Yes–this is me at all these sort of things. “At least we’re all awkward together.” I love it. I had a similar experience at a retreat obeying God when he told me to go pray with a stranger. He always knows. Hehe! I love being awkward with other writers. So “my people.” Jill, I love those kinds of stories! God always knows what someone else needs, if we can just tune in and listen! I’m outgoing and bubbly…with people that I know. And where I feel safe. Thank you for this, Amelia, and thank you for being so honest!